Anna Matic has worked at Assure for almost a decade. She is a fully-trained and qualified dermal therapist, who loves nothing more (and nothing less!) than fixing problems for her clients. Skin problems, that is. ‘Fluffy facials’ aren’t her thing. Instead, Anna has a genuine passion for advanced anti-ageing and corrective skin treatments that are medically-based and proven to work. I am very passionate about medical-grade skin treatments. Having started out as a beauty therapist, I found doing boring, fluffy facials all day long to be quite unsatisfying. While they were relaxing for clients, that was really all they achieved. They didn’t correct skin problems or address ageing. I wanted to provide better value and results in my work. So, I chose to go on and complete further studies and become a qualified dermal therapist. I studied at the Australasian Academy of Cosmetic Dermal Science. I have worked at Assure since 2009 and absolutely love my job. 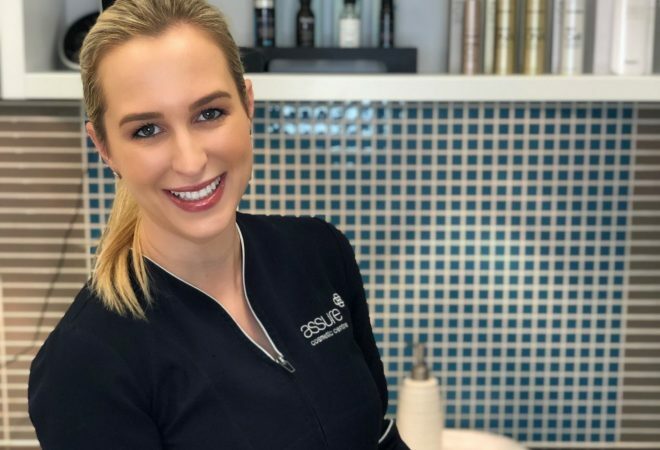 I only perform clinically-proven skin treatments, so I am constantly seeing amazing results in my clients, literally every day I come to work. I love that there’s not a fluffy facial in sight! I am very upfront and honest with my treatment approach. I never over-promise anything, which I believe my clients appreciate. I would describe myself as quite laid back, but informative in how I communicate. A lot of people are quite uninformed when it comes to proper skincare knowledge, so I don’t over-complicate things to make sure they’re comfortable. Medical skin needling, also known as microneedling, is one of my favourites. It’s also fast becoming one of the most popular treatments I do, mainly because of the results it achieves. It works on stimulating the body’s own natural collagen, so it produces a very natural result. It’s also ideal for brides-to-be, as it really freshens and plumps up the skin like nothing else. A big bonus is that skin needling is virtually painless. A lot of clients are scared to try it initially, but we use a medical-strength topical anaesthetic prior to the treatment, so it is hardly felt at all. Most people feel light pressure or a ticklish sensation. Microneedling works wonders in conjunction with injectable treatments like dermal fillers and wrinkle relaxers. While injectables can only be used in limited parts of the face, that isn’t the case for skin needling. Because it boosts your natural collagen overall, its effectiveness isn’t isolated to just one or two facial areas. It’s also what we recommend if someone is wanting an alternative to cosmetic injections, because it visibly enhances the skin so well. Another common skin issue for my clients is acne scarring. Microneedling is also really effective in addressing this. I love the honest and relaxed relationship I have with my clients. Seeing the change I am able to create in a person’s skin and the huge difference it makes to their appearance (and to their confidence), is a great feeling. I love being part of something so important for my clients. No fluffy facials! Find out more about Anna’s experience here, or to book an appointment for dermal therapy, click here.